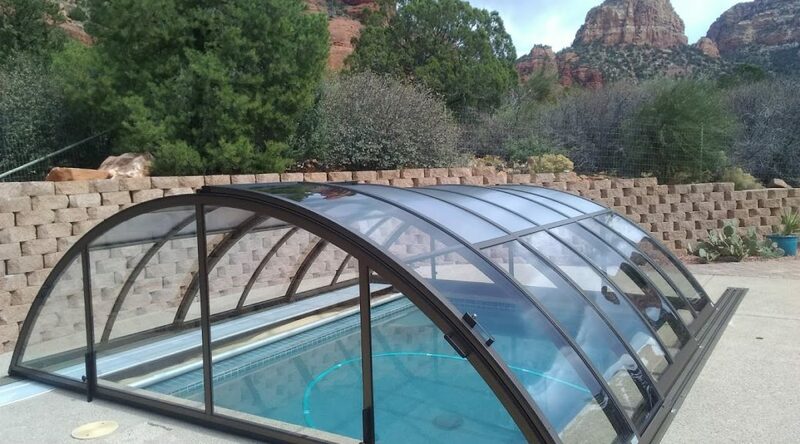 The new low profile retractable pool enclosure is getting popular in Arizona. 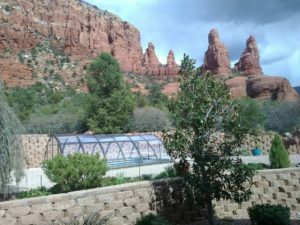 This model provides all the benefits of a pool enclosure without blocking the view of the Arizona’s magnificent landscape. 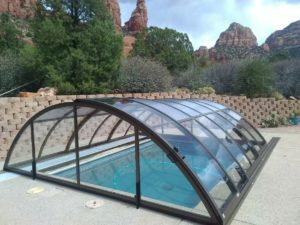 Additionally, this low profile retractable pool enclosure is the most cost efficient and affordable for a typical residential swimming pool. Owning your own pool allows you a lot of freedom, not the least of which is the ability to jump in and out of the cool water whenever you want to. However, once the seasons change and the weather takes a turn for the worse, that pool can become a pointless waste of outdoor space. If you’ve owned a pool for a long period of time, you know the constant tinkering with chemicals to find the right balance. Too much and your pool can cause irritation in the eyes and mouth of your swimmers, but levels too low may cause cloudiness in the water due to bacterial build-up. Constantly stocking up on the right pool chemicals and testing kits are also a big expense for pool owners, but adding a pool enclosure will reduce the amount of exposure to phosphates, pollutants and pathogens that can enter your pool’s water and reduce the need for chemicals. Throwing a tent or piece of canvas over your pool won’t keep your swimmers warm during the cooler months, but a custom enclosure with an electrical system, HVAC capabilities, and increased insulation will keep harmful UV rays out and warm air in. 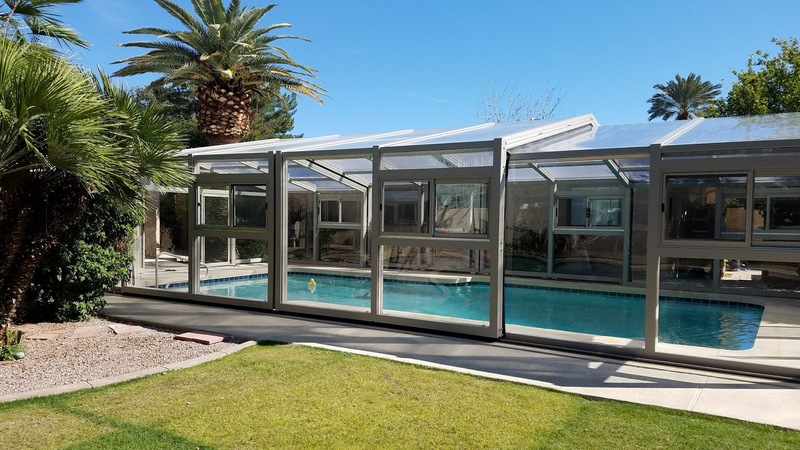 Many manufacturers offer custom branding and color options, so your tension fabric pool enclosure can easily blend into your home’s existing aesthetic instead of sticking out like a sore thumb. Pool enclosures with wide doors and window panels can become year-round fixtures in your backyard, providing shade for some and bright sunlight for swimmers. With year-round access to a pool in your own backyard, you can beat the cold weather-blues and continue an aerobics exercise regiment with lap swimming, water weights, and treading water without leaving your home! And because you’ll be training at the same temperatures every day, your body won’t have to acclimate every time you take a dip. Releasing muscle tension, reducing stress, and improving circulation are all benefits of water exercises, so keeping your pool accessible year-round may be a great boost to your overall health. 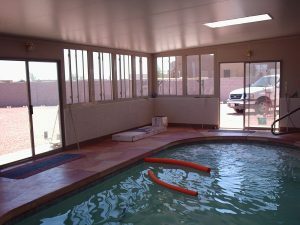 As with other aspects of your property, you’re liable for pool injuries. 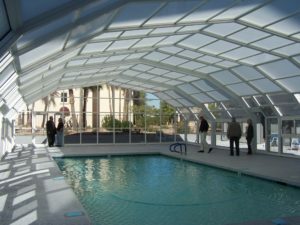 While pool owners do pay a higher premium for homeowner’s insurance due to the elevated risks of simply owning a pool, having a secure pool enclosure will prevent trespassers from having access to your water and help prevent accidents. Since your pool decks will be covered and heated, there won’t be any icy, slippery areas around your pool that come with owning a pool in the winter months. 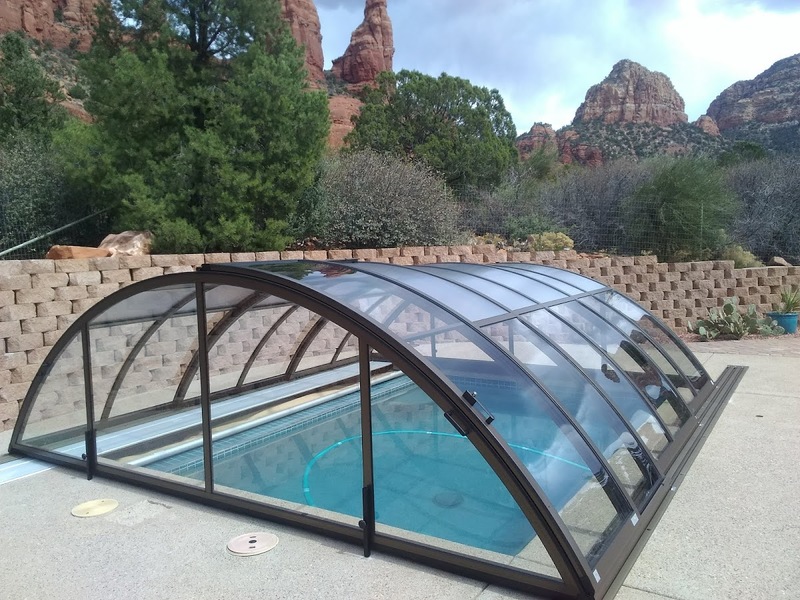 Covering your pool keeps out debris and cold weather, but a pool enclosure will also keep away wild animals and insects from putting a damper on your fun or possibly becoming trapped in your pool and drowning. 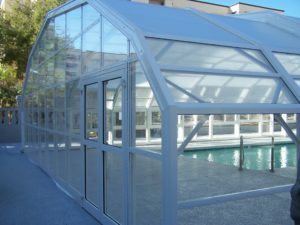 Same goes for intruders in your backyard – a pool enclosure equipped with its own security capabilities or incorporated into your home’s existing system will prevent unauthorized access and alert you to unwanted guests in your backyard. Using aluminum framing profile with Translucent Poly Carbonate roof panels and transparent Poly Carbonate wall panels. All with a UV protection. Varieties options available for windows and doors. 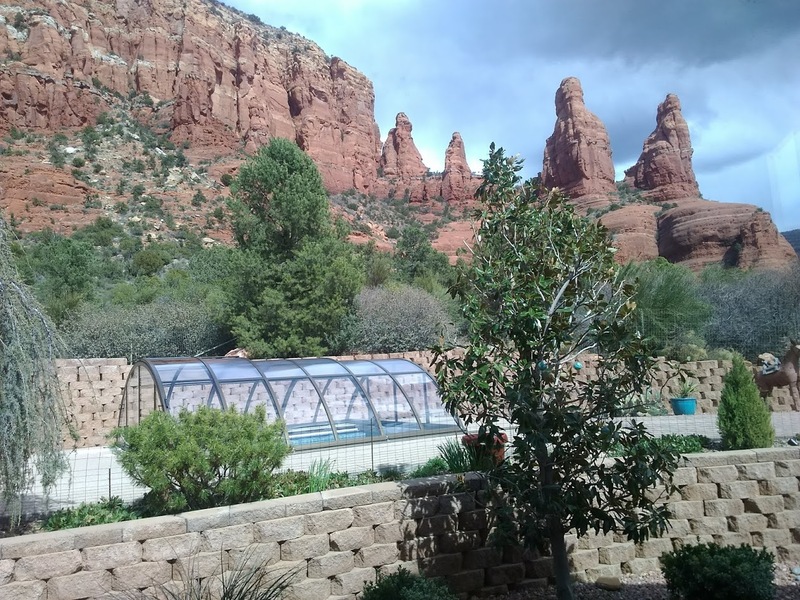 Here are several reasons why you should consider enclosing your pool in Arizona: 1) Protect the pool from flying debris due to the sand storms we experience throughout the year. 2) Save on overall pool maintenance expenses. 3) Extend the swimming season from few months to all year around. 4) Save on heating energy. 5) stop evaporation and save water. 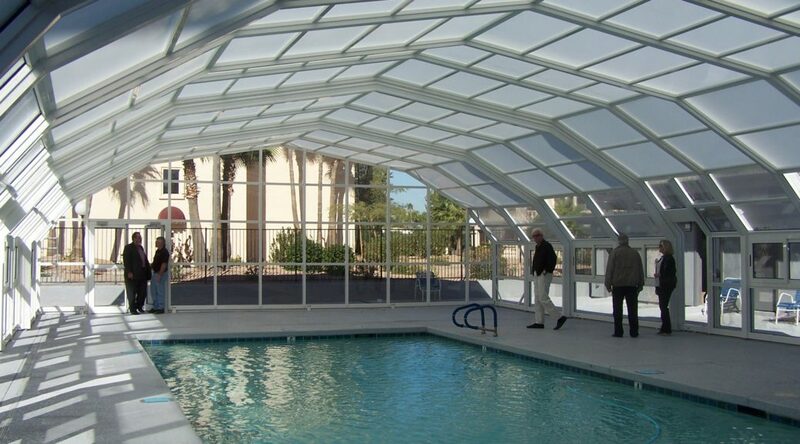 6) Use the pool during the sunny days because the enclosure provides shading and filtered out the UV rays. 7) Use the pool during the cold winter days and enjoys tropical type of environment. 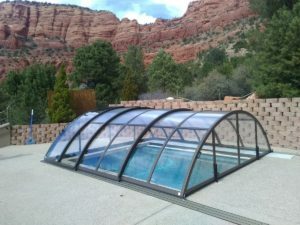 8) Having the ability to totally enclose the pool or open the enclosure partly or completely at ease.The best swimming pool enclosure is the one that rides on tracks that allow the homeowner to open or close the enclosure at any time. The pool enclosure that we use is built from extruded aluminum frame with a poly-carbonate glazing. 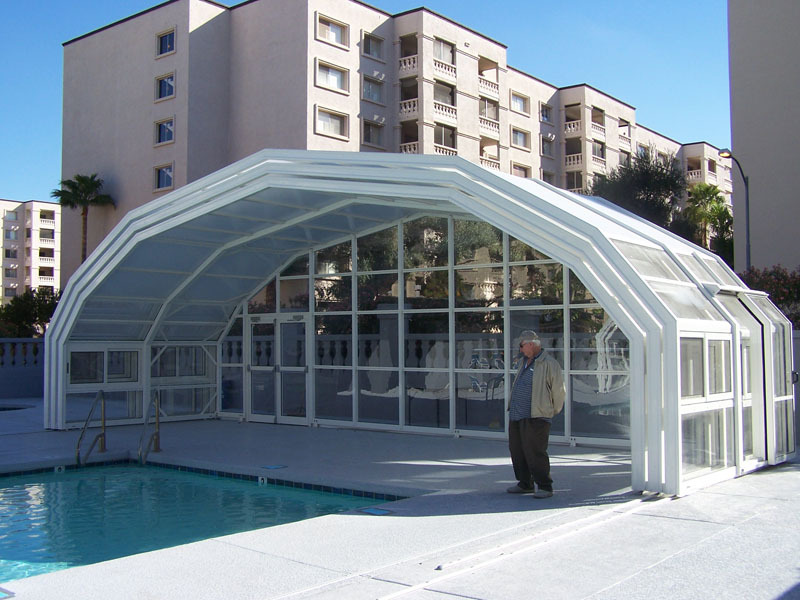 It is a maintenance free structure and engineered to meet all of the required building codes. 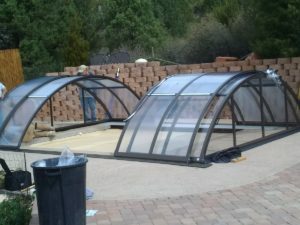 It might be a good time now to plan for a pool enclosure. 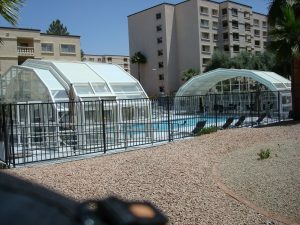 The summer benefits of having an enclosure is to protect the pool from our summer sand storms. As we all know, the sand storm deposit not only sand in our pools but all kinds of debris. The winter’s benefit are clear. 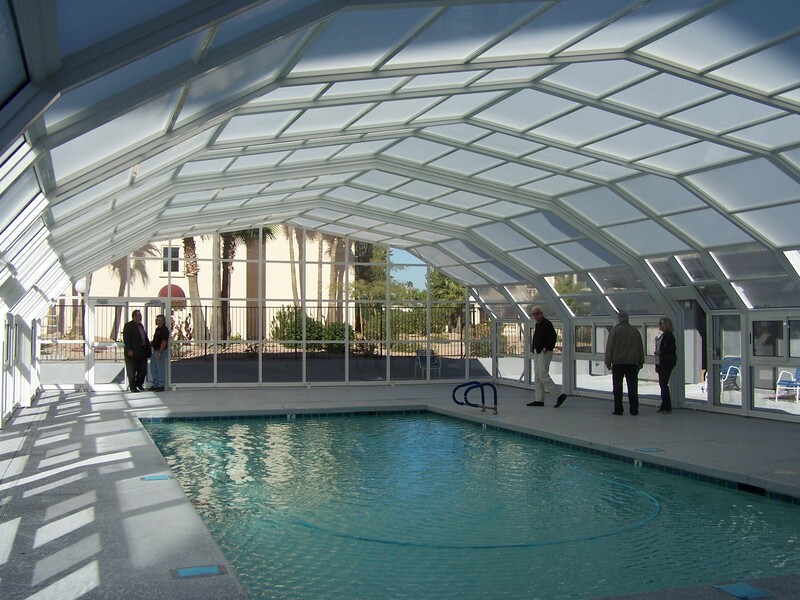 You can use the pool during the cold winter and save a lot of heating energy.